Our painting vacation holidays in Tuscany and Umbria are taught by our tutors Penelope Anstice, Jenny Smith, Catherine Sargeant and Jane Mitchell. Our painting holidays in Italy offer the perfect mix, daily classes with your art tutor, excursions to visit breathtaking historic and natural sites, delicious food and drink accompanied by evening discussions about the days work. Our holidays are designed for mixed ability groups and you will leave us having transformed your way of thinking and looking, with a sketchbook full of new ideas and techniques. The painting holidays in Italy are an excellent value for your money as everything is included. All food and drink, daily painting lessons, excursions throughout with private minibus, private villa and airport transfers in Italy are included in the price. 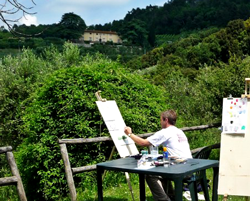 The venue for the painting vacations in Tuscany is situated in wonderful gardens with a swimming pool surrounded by rich, relaxing and evocative natural scenery. Ancient Olive groves and green meadows make for an ambient mix of shadows and quiet places: the perfect place to relax and inspire the body and mind as well as the creative juices! Arrive at Pisa airport at approximately 3:00 PM where you will be met by your host and transferred to Villa Maria. Welcome drinks and dinner on the terrace. After breakfast you will have an introduction to watercolor, looking at basic techniques, different kinds of paper, brushes etc. There will be a demonstration in how to do quick sketches in the medium. The afternoon is free to enjoy as you wish. Dinner will be at the villa. There will be a demonstration of landscape painting after breakfast, looking at different ways in which to apply watercolor and the mixing of other media like pastel and colored pencil. Following lunch there will be an afternoon visit to a private painting location for you to try out techniques. In the evening we will have a critique of the work so far, followed by dinner. After breakfast there will be a lesson in the elements of composition and color and the chance to experiment further with the medium. Following lunch, an afternoon visit to Lucca with an opportunity to sketch. Dinner at the villa. Today we take a visit to Florence for a full day of gallery visits at your leisure and meet for lunch at a traditional trattoria. Before dinner we will have an evening discussion of the work so far and a look at some examples of traditional and contemporary watercolor painting. A chance today to try larger scale and more ambitious work using sketches and ideas accumulated do far. This will take up the large part of the day with a break for lunch on the terrace. In the latter part of the afternoon we will visit a local vineyard and the evening will be spent in Lucca with dinner at a local restaurant. After breakfast we will look at the work so far with a critique on progress and a chance to continue to work in and around the villa. For the rest of your last day you are free to continue painting, to relax by the pool or go walking. Dinner will be at the villa and we will have a group show of the work created during the week. Depart for airport after breakfast. Umbria’s landscape of lush rolling hills dotted with ancient castles, fortresses and watchtowers is a wealth of material for any budding painter. 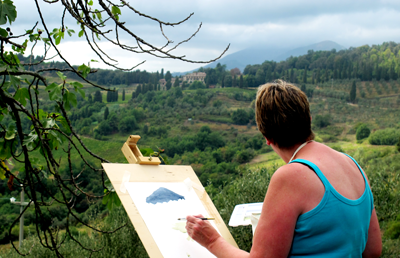 On one of our painting holidays in Umbria you can't help but be inspired. 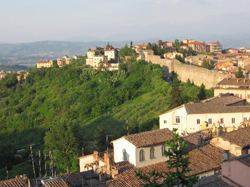 Our hillside location near the picturesque medieval town of Todi provides stunning views across the landscape. The Umbria painting courses are ideal for beginners and experts as we have a relaxed itinerary that allows for a great deal of experimentation and development at all levels. 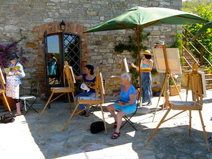 Our painting holidays in Umbria itinerary below will give you more of an idea as to what this course entails. Our local guide will meet you at Rome Fiumicino Airport and take you to the villa for welcome drinks followed by dinner prepared by our local chef. After breakfast you will have your first painting lesson with an introduction to watercolour looking at basic techniques, different kinds of paper, brushes etc. The afternoon is yours to paint or relax by the pool. Dinner is prepared for you at the villa. After breakfast you will have your first painting lesson with an introduction to watercolour looking at basic techniques, different kinds of paper, brushes etc. After lunch (weather permitting) enjoy a short visit to a place of local interest with a chance of painting on location. Dinner tonight is at the villa. Demonstration of landscape painting after breakfast, looking at different ways to apply watercolour and mixing media like pastel and coloured pencil. Following lunch there will be an outing to use the techniques. Then a critique of the work so far, followed by dinner. After breakfast, a day to enjoy the local area (eg. Norcia and its famous Norcineria, or the lovely hilltop town of Todi, or the medieval town of Spoleto), with a chance to explore and paint on location. Enjoy lunch in a local restaurant. Return to villa late afternoon for dinner. After breakfast there will be a lesson in the elements of composition and colour. Lunch on the terrace. The afternoon is free to enjoy as you wish. Dinner is at the villa. After breakfast there will be another painting lesson, then lunch. The afternoon will be spent in a place of artistic interest (eg. Orvieto). There will be opportunity for painting on location, before dinner in a local restaurant. A leisurely morning to spend developing your work. After lunch, you are free to paint, relax by the pool or go walking. Dinner at the villa with a group show of your paintings. After breakfast our transfer will collect you and take you back to Rome Fiumicino Airport for your flight home. Our Venice painting taster sessions are great for beginners and experts as we have a relaxed itinerary that allows for a great deal of experimentation and development at all levels. Please see the sample itinerary below for more detailed information. Our Flavours transfer will meet you at Marco Polo Airport and take you to the villa for welcome drinks on the terrace followed by dinner prepared by our local chef. venice-canal-smallAfter breakfast you will have your first painting session, with an introduction to watercolour looking at basic techniques, different kinds of paper, brushes, etc., followed by lunch. The afternoon is yours to continue painting, relax by the pool or walk through the olive groves. Dinner is prepared for you at the villa. Excursion to the city of Venice with a chance to explore this historic city and paint or draw on location. A packed lunch will be provided to allow you to maximize your time at the location for sketching. The afternoon is yours to continue painting and developing your works. Dinner tonight is prepared for you at the villa. A leisurely morning to spend with the painting turor, developing your work at the villa. For the rest of your last day you are free to paint or relax by the pool. Dinner at the villa with a group show of your paintings. After breakfast, our transfer will collect you and take you back to Marco Polo Airport for your flight home.